No, no. Not every burger restaurant in Japan is like this. Too bad, huh? The Lotteria in Tokyo's Ikebukuro is... different. One floor of the restaurant is reserved for anime collaborations and covered in whatever show (or game) is being promoted, whether that's Sword Art Online, Fate stay night, or The Idolmaster. Not only are walls covered in anime art, but there are usually special themed meals and sometimes even manga or light novels you can read free of charge. These collaborations kicked off in 2013 for the Madoka Magica movie, and in comparison, the Madoka floor looks rather tame, almost quaint, by today's standards. 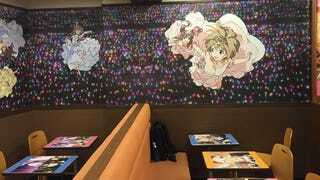 Since then, there has been a steady rotation of other anime-type characters to cover the walls, giving this fast food restaurant a unique atmosphere. The characters are designed up in Lotteria uniforms, and the restaurant has special, limited goodies on sale, too. Even the sign for the men's and women's restroom gets switched out.